This week’s episode starts off with a boy showing up at Ayakashi Kan to see his father. The boy realizes that the passage of demon blood is similar to reincarnation, so Zange proposes a time capsule to send a message to his father in his next life. The other tenants join in as well, each submitting their own letters. Ririchiyo joins in as well, thinking about the bonds she has made. The boy turns out to be the son of the bartender (I’m sure he’s been introduced before, but I just didn’t notice). Ririchiyo accidentally puts the wrong letter in the time capsule, giving the true time capsule letter to Soushi with a gift. She tries to stop him from reading it, but is too late. 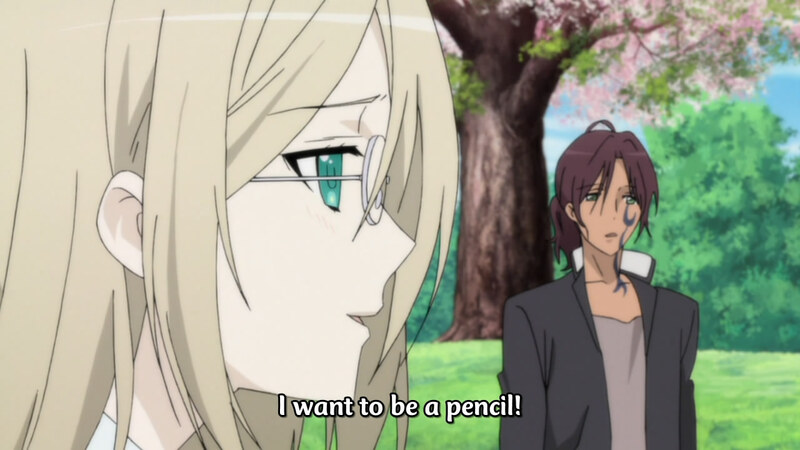 When Soushi calls later, she tries to play off the letter, and Soushi responds with his typical self-deprecating style. Ririchiyo realizes how Soushi truly feels and decides she wants to help him. The two confess to each other. What a nice and refreshing ending. This episode was great as always…hilarious at some points and touching at other points. Like Ririchiyo’s plans for when Soushi called had me laughing like crazy (go go plan 3!!). I thought the part about wanting to have a child was a little random, but it was still okay. I’m glad they chose to have an ending where Ririchiyo and Soushi are together, rather than one of those ambiguous endings where they know their feelings for each other or something. It has definitely been fun to blog this show. It’s too bad it has to be over…Oh well. The way it ended, I don’t see much potential for other seasons, but it looks like the manga goes further, so I’ll probably immerse myself in that. I’ll also review the whole show later. This week’s episode starts off with Soushi’s past. Locked up as a child, Soushi learns to use his charm to manipulate women and gain more freedom. 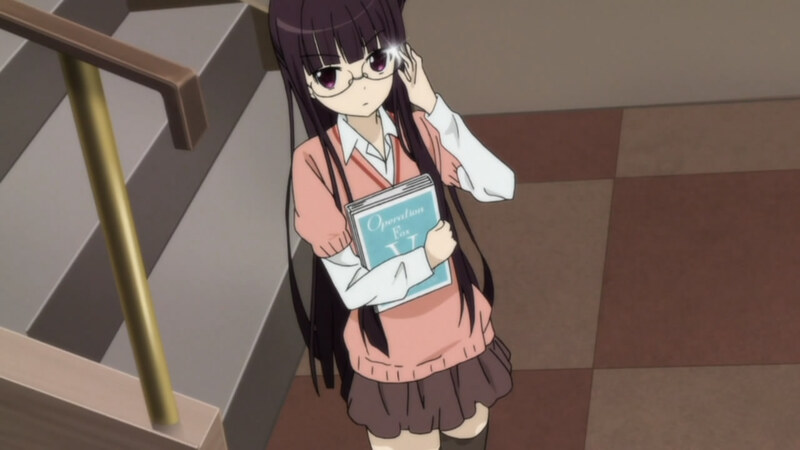 He would eventually meet Shoukiin Ayame, Kagerou’s mother, and start working under Kagerou. Kagerou eventually has him write the letters back to Ririchiyo for him. Through these letters, Soushi starts to develop a “self”, an identity. In one letter, he decides to write something true about himself rather than acting as Kagerou, and he is surprised to find that Ririchiyo actually notices. Back in the present, Kagerou is about to tell Ririchiyo that the letters from the past were not written by him, but she interrupts saying she already knew this. Kagerou then leaves Ririchiyo alone with Soushi, telling her that he wrote the letters. 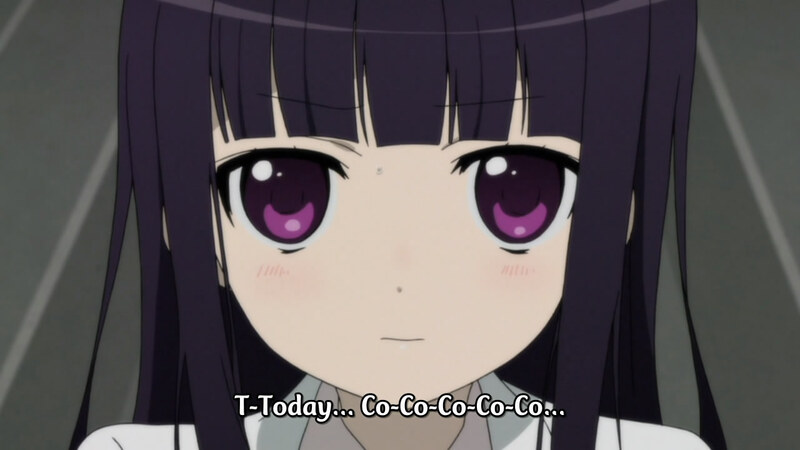 This episode acted almost like a conclusion. I feel like they probably could have ended the show with it. 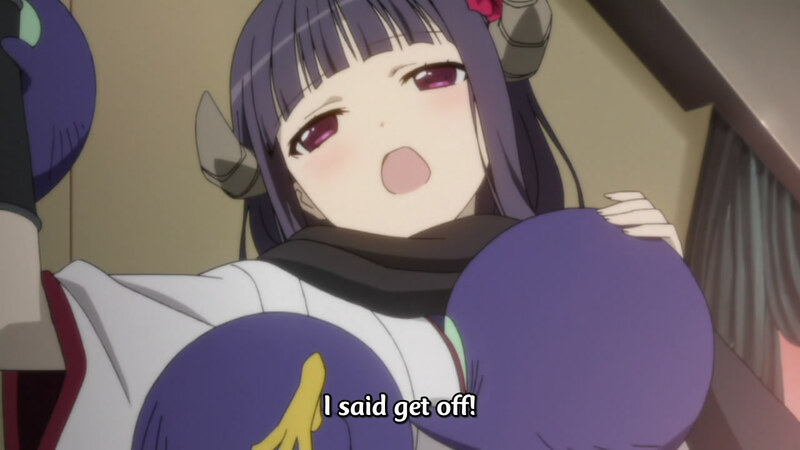 Still, there’s another episode. So I wonder what they plan on throwing in there. It could be one of those light episodes that wraps everything up…that would probably be nice. Maybe Ririchiyo and Soushi will finally have that coffee. I don’t really care about the coffee…I just wanna be right about the show building up to it (it’s a pride thing). Anyway, one more left…hope it finishes nicely. So Kagerou’s entrance throws off the coffee date for Soushi and Ririchiyo. Kagerou also mentions that he has something important to discuss with Ririchiyo and picks her up from school. Ririchiyo goes to apologize to Soushi and manages to catch him in normal clothes. Ririchiyo realizes that Soushi is acting strange and runs away, but finally realizes that she loves him. The next day, Soushi goes to Kagerou to beg him not to tell Ririchiyo his secret. When Kagerou refuses, Soushi attacks him. 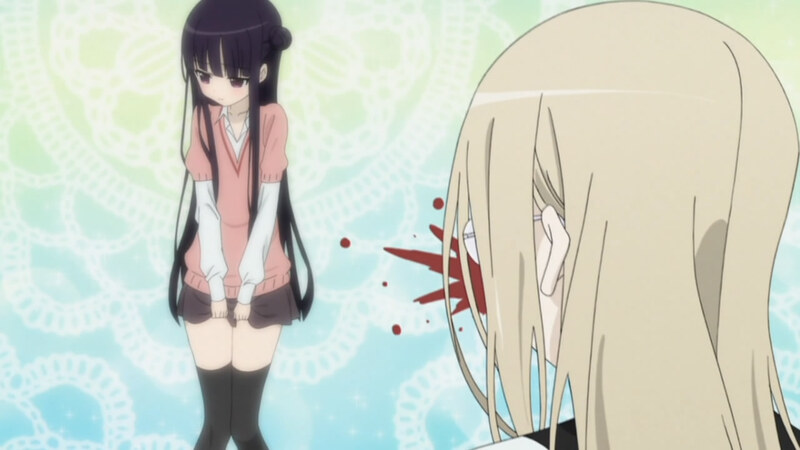 The episode ends when Ririchiyo walks in on the two and Soushi finally begins to tell Ririchiyo his secret. Gah…a cliffhanger! Not another one…This is gonna plague me for…a week. 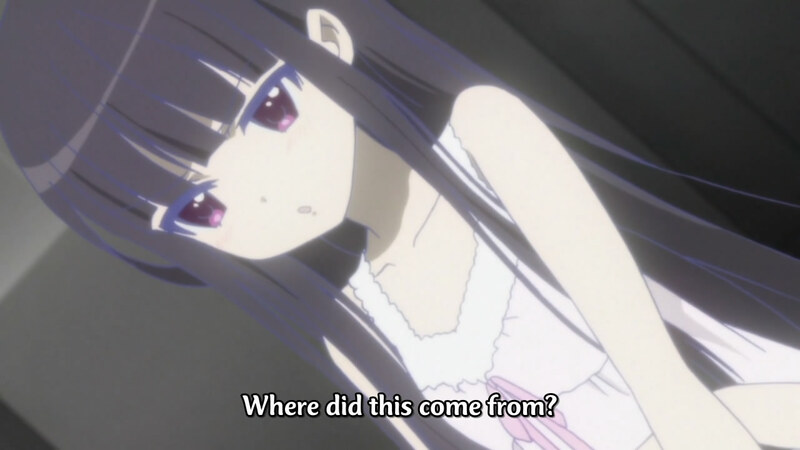 I thought the scene where Ririchiyo realizes how she feels was pretty cute. Also, it was weird to see Soushi with his casual clothing…never would’ve guessed he wore glasses. Next week, I guess we find out Soushi’s big secret…wonder if it was really worth the lengths he took to hide it. Still enjoying this series…I don’t even care that the demon part isn’t used too often. The big event is coming up…Ririchiyo having coffee with Soushi. Ririchiyo is very anxious in anticipation, spending some time with Karuta after school and cleaning her room up in preparation. With so much time remaining, Ririchiyo goes to study with Karuta and Banri. When Banri gets brings up the walk rally with Ririchiyo from before, Natsume proposes another competition, a partner game. At one point, there is an event where the players answer questions about their partners, which Ririchiyo fears because she doesn’t know much about Soushi. However, Soushi starts to rant about Ririchiyo and her turn never arrives. The episode ends with the return of…Kagerou! 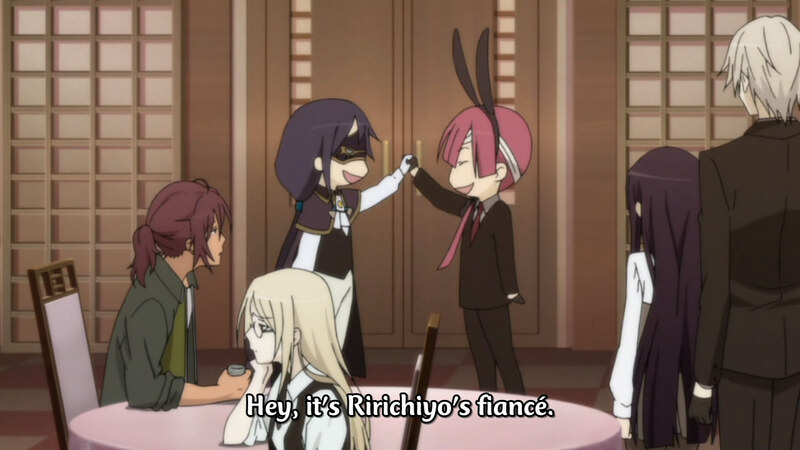 This week’s episode starts off with Ririchiyo wondering about the difference between her relationship with Soushi and the relationships of the other tenants of Ayakashi Kan. She realizes she doesn’t really know much about Soushi and endeavors to find out more. 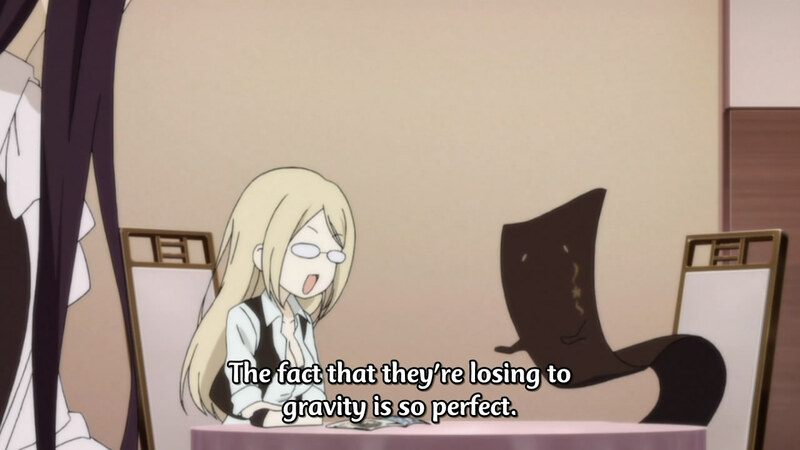 Realizing she’s never eaten with Soushi, she tries to make coffee for him. While she makes the coffee without incident, she doesn’t know how to invite him to have some. After multiple failed attempts, Ririchiyo is finally able to pull it off. This show is so funny. Soushi’s observation of Ririchiyo is of epic proportions (“you added 1.5 grams more sugar in your tea”…classic). 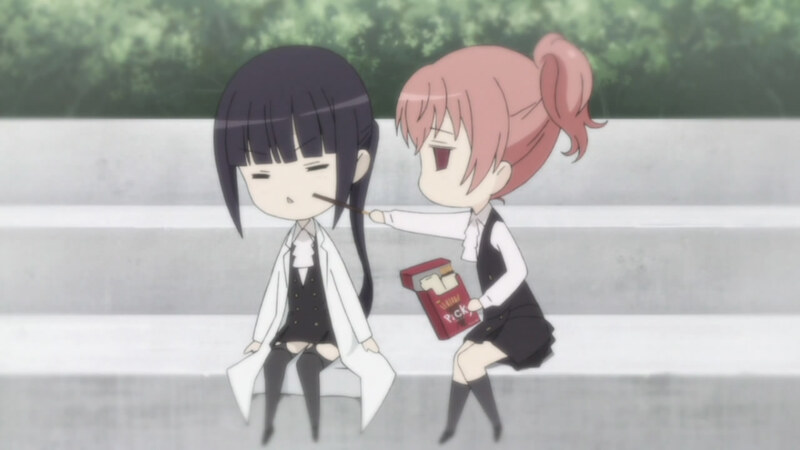 I thought this episode would have some action, but it turned out to be an amusing episode devoted to Ririchiyo asking Soushi to drink coffee with her. 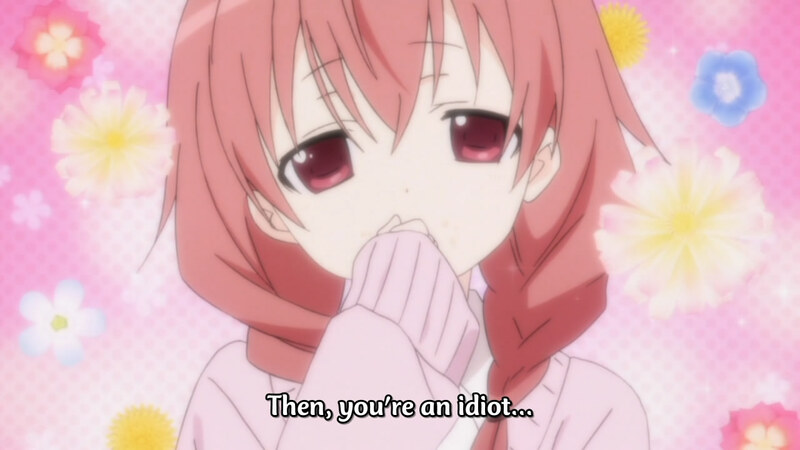 A lot of classic tsundere lines too (all that was missing was “baka!”). We caught of glimpse of Soushi’s big secret. Some sort of bad relationship with a former client (or maybe it was just too good O.o). Next week looks to be another zany episode (courtesy of Natsume). Should be entertaining! We’re getting pretty close to the end of the season and there doesn’t seem to be any plot yet…is there ever going to be any? Nothing better to start off an episode than demonic plants. Chino, the maid, brings a plant to Ayakashi Kan which goes nuts and activates the mansion’s security system. 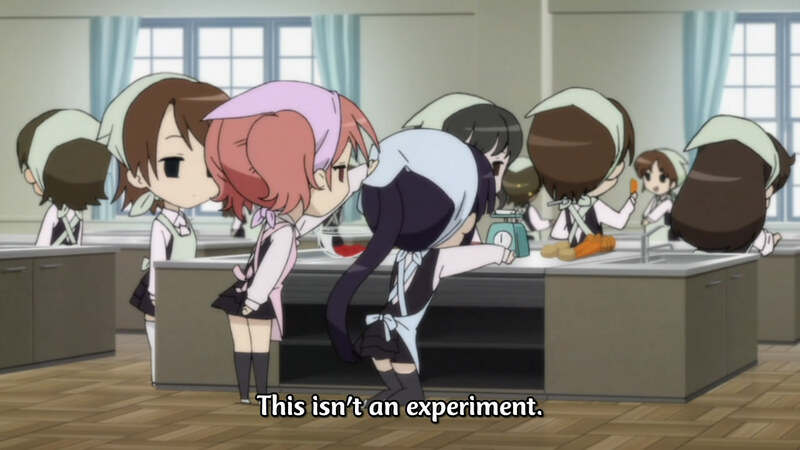 This leads to Banri being locked in the Hyperbolic Time Chamber (Natsume is such a good liar), Karuta being locked in a kitchen, and Ririchiyo being locked in her room with Soushi. Ririchiyo spends the night trying to finally express her gratitude to Soushi, finally managing to thank him after many mishaps. Banri accidentally breaks the force field, which causes the security system to fail. However, the enemies are weaker than expected, so everyone takes them out easily. The splitscreen transformation scene for Soushi and Ririchiyo looked like something out of Power Rangers (lol). Anyway, nothing like a trapped situation to force main characters to tell other characters their feelings. Ririchiyo yelling at herself every time she failed to thank Soushi was pretty funny to watch. This show is still funny and still entertaining. A bit more action this week, but it really wasn’t that prevalent. The relationship between Soushi and Ririchiyo seems to be developing too quickly, so I expect next week or the episode after that will reveal Soushi’s big secret to throw a wrench into things. I’d say next week for sure, but the preview makes it look like a fairly relaxed episode. 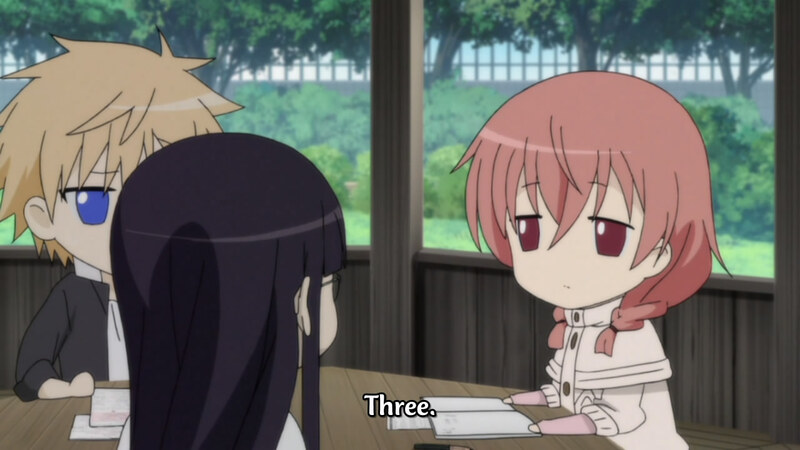 This week’s episode starts with a focus on Karuta, who kinda just does whatever she feels like at school. This brings the ridicule of her classmates, which leads to Banri getting into a fight with a bunch of kids that make fun of her. 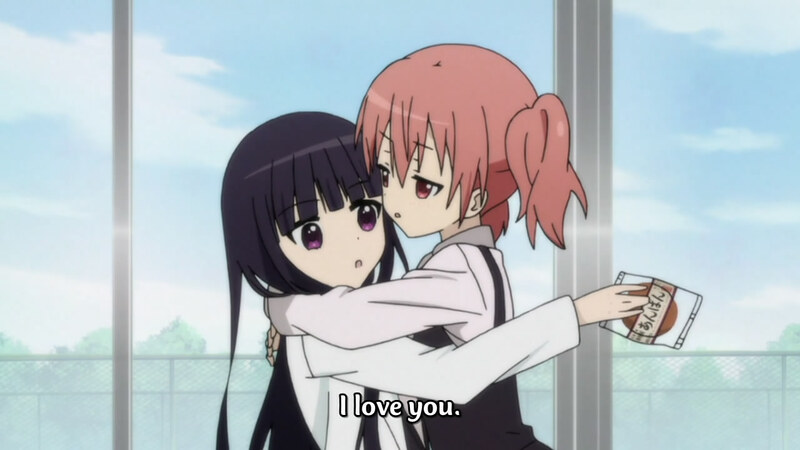 Meanwhile, after a hilarious declaration of love from Karuta, Ririchiyo starts to interact with her more. After school, a storm starts up and Ririchiyo is attacked by a nure-onna, which is basically a humanoid water snake. Banri shows up to help, but gets beaten pretty quickly. Ririchiyo gets a solid hit in with Banri’s help, but the monster lashes out again, knocking them both out the window. Karuto appears to save them both. So this episode was more Ririchiyo making friends. I almost wonder if this show will be like a few shows I’ve seen with the random lighthearted slice of life style up until the very end, when the plot ramps up into overdrive. I suppose there was some random action mixed in, but it really isn’t much. What actually happened to that nure-onna? Final attack and then it just disappears? Next week looked like more stuff on Karuta, but the preview also made it sound like it focuses on Ririchiyo. So Banri from last week ends up in Ririchiyo’s class. Ririchiyo starts getting strange texts from an unknown address with stalker-ish messages. Trying to find a way to express her gratitude to Soushi, Ririchiyo decides to write a letter to him. She goes out shopping for stationery, and ends up returning late at night. Soushi appears, having been worried and she tries to tell him how she feels, but they are interrupted by a masked assailant. He turns out to be Shoukiin Kagerou, Ririchiyo’s fiancee and turns out to be Karuta’s current master and Soushi’s former master. He goofs off for a while in Ayakashi Kan, but leaves almost as quickly as he arrived. Another funny episode. 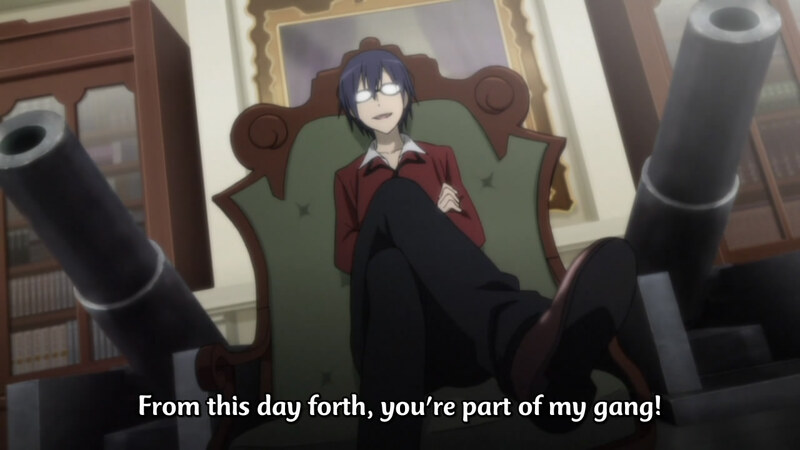 I dunno what’s up with Kagerou, but his antics were definitely entertaining. So with five episodes done, I guess this show is really just gonna be slice of life with monsters. I’m a bit surprised after how it began, but I still like the show. Next week looks to be focused more on Banri and his relationship with Karuta, so it should be fun. So while Ririchiyo deals with her emerging feelings for Soushi, she meets the new characters that made an appearance last week. The first introduces himself as Banri Watanuki and immediately reveals himself to be a tanuki. His Secret Service agent is Zange Natsume, who seems to be clairvoyant in some way. Zange and Soushi are old friends, but Watanuki challenges Soushi a death match. The death match ends up being a race to gather the signatures of all the residents of Ayakashi Kan. We get to meet the…interesting tenants around the manor. 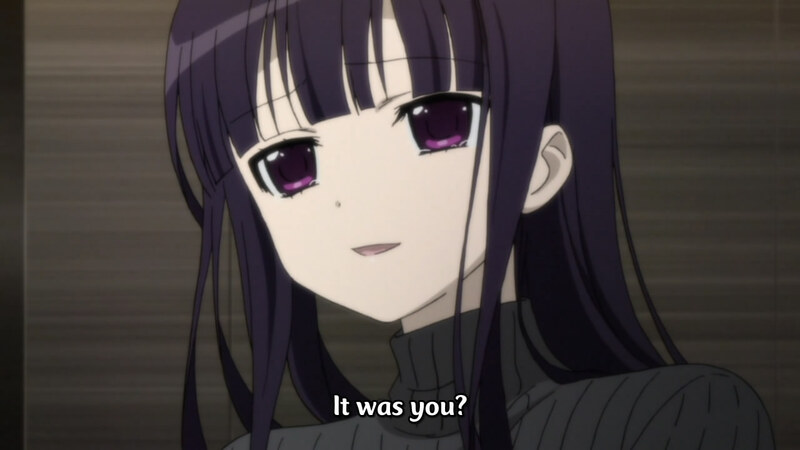 The last signature turns out to be Karuta, but Watanuki reaches her first. Zange reveals that the whole match was just an excuse to get Watanuki to talk with Karuta. 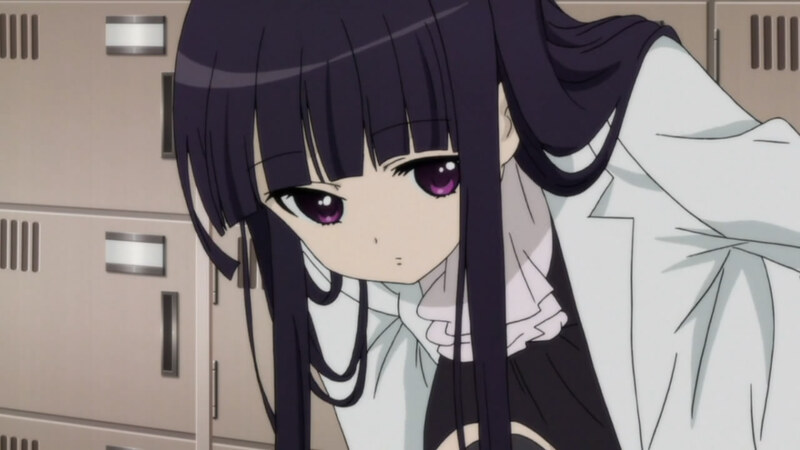 Oh Ririchiyo…you would suspect an irregular heartbeat to be health-related. Her relationship with Soushi seems to be developing a lot more quickly than I expected. 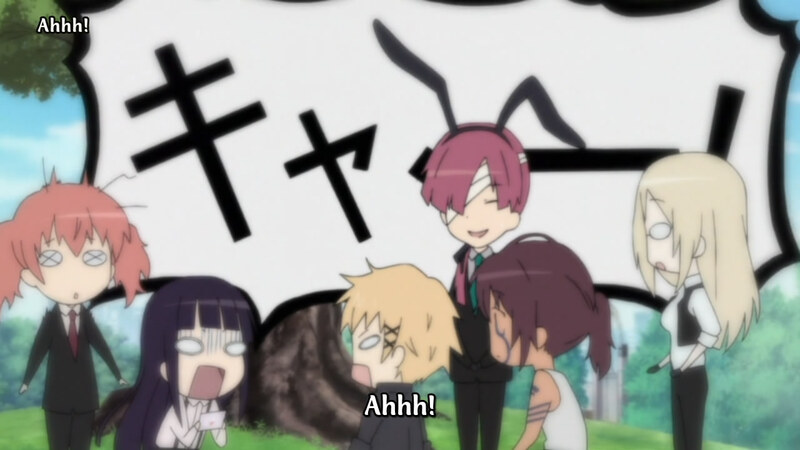 Also, it looks like Soushi is hiding something that Natsume knows. Based on what I’ve seen, it must be something pretty big because I’m sure it will be used to slow the progress of Ririchiyo and Soushi’s romance. I wonder what it could be. 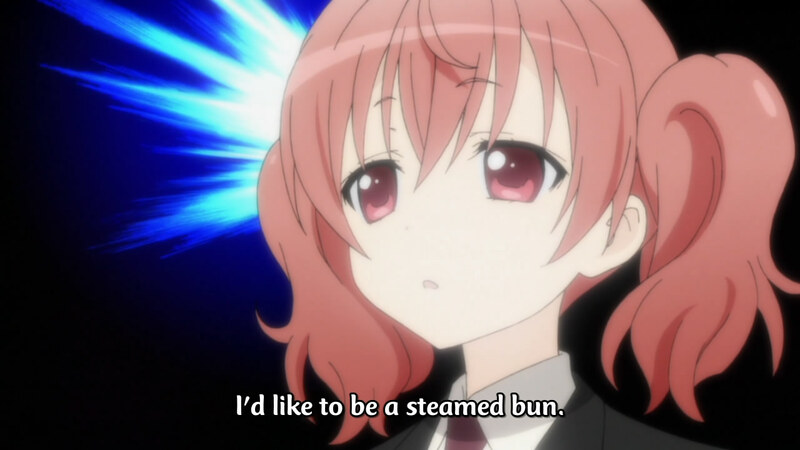 I guess this show will take the path of standard slice of life with fanservice. Next week seems to be another character introduction, but I see nothing that hints at conflict or action, only more comedy.